For the treatment and control of gastro-intestinal nematodes, lungworms, warbles, chorioptic and sarcoptic mange and sucking and biting lice of beef and non lactating dairy cattle. POM-VPS. Excipients: For the full list of excipients, see below. For the treatment and control of gastrointestinal nematodes, lungworms, eyeworms, warbles, chorioptic and sarcoptic mange and sucking and biting lice in beef and non-lactating dairy cattle. The product given at the recommended dosage of 500 μg/kg bodyweight, controls infections with Trichostrongylus axei and Cooperia spp. acquired up to 14 days after treatment, Ostertagia ostertagi and Oesophagostomum radiatum acquired up to 21 days after treatment, and Dictyocaulus viviparus (lungworm) acquired up to 28 days after treatment. It also controls horn fly (Haematobia irritans) for up to 35 days after treatment. The product has been formulated for topical application specifically in cattle. Do not apply or administer to other species as severe adverse reactions, including fatalities in dogs, may occur. Do not apply to areas of skin which have mange, scabs or other lesions or to areas contaminated with mud or manure. Resistance to macrocyclic lactones (which includes ivermectin) has been reported in Cooperia spp. in cattle within the EU. Therefore, the use of this and other similar macrocyclic lactone products should be based on local (regional, farm) epidemiological information about susceptibility of nematodes and recommendations on how to limit further selection for resistance to anthelmintics. HIGHLY FLAMMABLE – KEEP AWAY FROM HEAT, SPARKS, OPEN FLAME OR OTHER SOURCES OF IGNITION. May be irritating to human skin and eyes and the user should be careful not to apply it to himself or other persons. Operators should wear nitrile rubber gloves and boots with a waterproof coat when applying the product. Wash all protective clothing after use. If accidental skin contact occurs, wash the affected area immediately with soap and water. If irritation persists, seek medical advice and show the package leaflet or label to the doctor. If accidental eye exposure occurs, flush the eyes immediately with plenty of water and get medical attention. Do not smoke or eat while handling the product. Wash hands after use. Use only in well-ventilated areas or outdoors. Undesirable effects are not expected when the product is used at the recommended dose rate. The product can be administered to beef cows at any stage of pregnancy or lactation provided that the milk is not intended for human consumption. It will not affect the fertility of cows and bulls and can be given to all ages of animals including young calves. Please also refer to ‘Special warnings for each target species’. Not known. May be used concurrently with foot and mouth disease vaccine or clostridial vaccine. Dosage: 1 ml per 10 kg bodyweight (based on a recommended dosage level of 500 μg/kg bodyweight). Administration: The formulation should be applied along the mid-line of the back in a narrow strip between the withers and tailhead. To ensure administration of a correct dose, bodyweight should be determined as accurately as possible; accuracy of the dosing device should be checked. The 250 ml pack contains one 25 ml dosing cup and one dip tube. The 1 litre pack contains one 60 ml dosing cup and one dip tube. Insert the dip tube into base of the dosing cup. Leave the "slotted end" of the dip tube exposed in the bottom of the bottle. Unscrew bottle cap from the top of the bottle. Screw the dosing cup onto the top of the bottle. Measure: To select the correct dose rate, rotate the adjuster cap at the top of the cup in either direction to position the dose indicator to the weight of the animal you want to treat. When body weight is between markings, use the higher setting. Squeeze the bottle gently to fill the dosing cup to the required dose. Release your grip and any excess will return to the bottle. Pour: Apply the full dose by tipping and pouring along the back line of the animal until the dosing cup is empty. The dosing cup should not remain attached to the bottle when not in use. Detach the dosing cup after each use and replace the bottle cap. ** An applicator compatible with the formulation is available for use with the 2.5 litre pack of IVOMEC Pour-On. Other applicators may be incompatible with the formulation, resulting in locking, incorrect dosage and leakage. No sign of toxicity appeared in trials up to 5 mg/kg (10 times the recommended dose rate). No antidote has been identified. Meat and offal: 15 days. Do not use in cows producing milk for human consumption. Do not use in non-lactating dairy cows including pregnant heifers within 60 days of calving. Triethanolamine, Isopropyl alcohol, Crodamol Cap. Avoid extremes of temperature. Protect from light. Store in tightly closed original container. Store upright. The dosing cup should not be stored attached to the bottle when not in use. Remove the cup after each use and replace with the bottle cap. 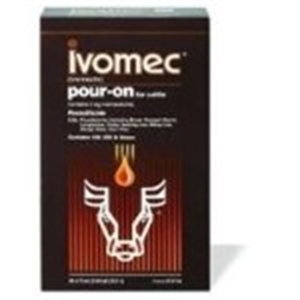 If stored at temperatures below 0°C, IVOMEC CLASSIC Pour-On may appear cloudy. Allowing the product to warm at room temperature will restore the normal appearance without affecting efficacy. 1 litre measure-squeeze-pour bottle, 2.5 litre high density collapsible backpacks. EXTREMELY DANGEROUS TO FISH AND AQUATIC LIFE. Do not contaminate surface waters or ditches with the product or used container. 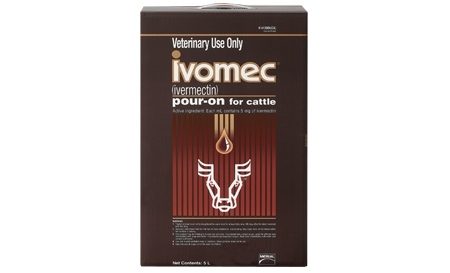 Below are some recent questions we've received regarding Ivomec Pour-On For Cattle, including answers from our team. Can it be used in the wet? I want to use Ivomec pour on with cattle when they are gathered for a TB test, but the forecast is giving rain. Can I still use it even in the rain? Yes, thats fine. Rainfall before or after treatment will not affect the efficacy of the Ivomec. Is this product the same as eprinex? EPRINEX is the new endectocide from Merial, developed by the scientists who discovered IVOMEC. It is based on a new molecule, eprinomectin, which gives it greater potency, killing even more species of parasites than ivermectin (Ivomec). This also means that EPRINEX is able to kill more worms for longer than any other pour-on. Other unique properties of the product mean that it is the only endectocide with a zero milk withdrawal period and it can be used in all weathers, including heavy rain. This is not licensed or recommended. It has been tested and found not to be very effective unless you increase the dose quite a lot. Under-dosing will encourage the development of resistant strains of parasites. Generally it is not regarded as a good idea and we would not advise this product is used on horses.